On Saturday 13 February, as part of our Love Artists programme, all visitors to Stanley Picker Gallery will be invited to participate in the realization of a large scale-drawing that has potential to reach and occupy every nook, cranny and height of the Gallery Lobby. 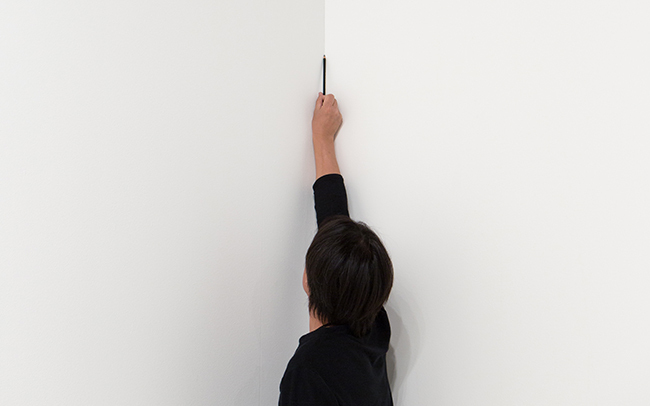 Referring to instructions from acclaimed Taiwanese installation artist Lai Chih-Sheng, visitors will create this work by drawing single pencil lines along areas where different surfaces meet, and around our fixtures and fittings – their marks over the course of the day and time, revealing the complex physical architecture of the space. This interaction is the brainchild of Stanley Picker Gallery Assistant and SatChat founder Grant Bingham, who has been following the practice Chih-Sheng since Invisible: Art about the Unseen 1957 – 2012 Hayward Gallery (2012), and having identified parallels between this and current Stanley Picker Gallery exhibition Charlotte Bergson: The Hunters of the Invisible, sought a collaboration. Lai Chih-Sheng was born 1971 in Taipei (Taiwan), where he lives and works. His work plays upon the basic features of accident and coincidence, and to encounter is both large-scale and subtle. Previously exhibiting venues include Para Site (Hong Kong), October Contemporary Art Terminal (Shenzhen), Hayward Gallery (London) and National Taiwan Museum of Fine Arts (Taichung).